As I told you in last week's Manicure Monday, I've had my Christmas nails planned for a while now, unfortunately though this week's didn't work out. I bought some Santa nail gems but they're huge. I've grown my nails for the last three weeks so they'd fit, but even though they fit on my nails now, they just looked odd so I had to take them off and go with plan B. Nothing says Christmas more than glitter and red, so I decided to go with Sardonyx from Models Own Velvet Goth collection. Sardonyx is a gorgeous ruby red polish packed with tiny sparkly red glitter and fine matte black glitter. This polish, along with the rest of the Velvet Goth collection, dries to a matte finish, but with the addition of a top coat it's a sparkly wonder that is just perfect for the holidays. You may have read my thoughts on other polishes from this collection, and I'm glad to say that this polish applies better than any of the others I've worn so far. These photos show 2 coats of Sardonyx with one coat of Seche Vite. On my ring fingers I'm wearing three coats of Cleopatra from China Glaze. I've worn this polish in a few Manicure Monday's and it's my favourite gold glitter, I just can't pick up on camera how sparkly it is in real life. 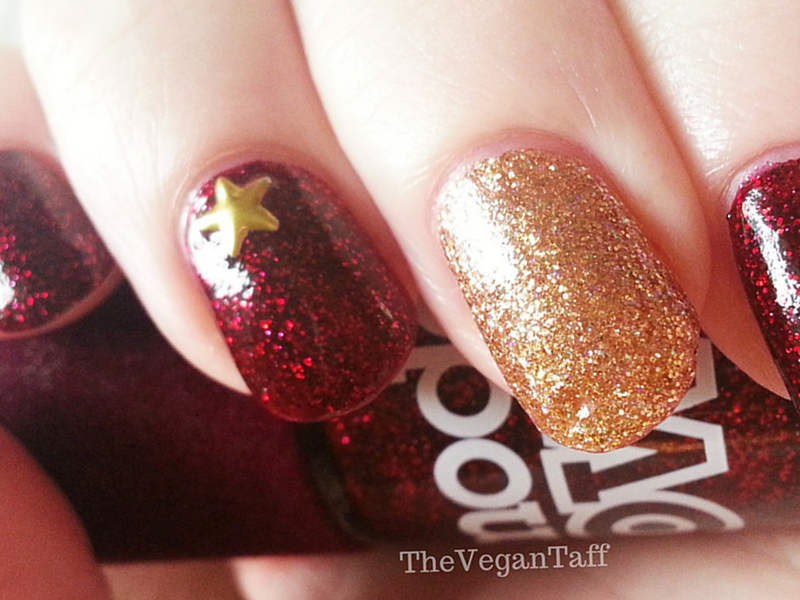 On my middle finger I decided to apply a small gold star, because what's more Christmassy than red, gold, glitter and stars? I used my top coat to fix it to my nail and seal it in. Models Own Velvet Goth in Sardonyx is available from Models Own website and Superdrug stores nation wide and online for £5. China Glaze Cleopatra is available from Nail Polish Direct for £3.95 (rrp £8.95). The nail studs are available from eBay in a nail wheel for 99p. What do you think of this mani? 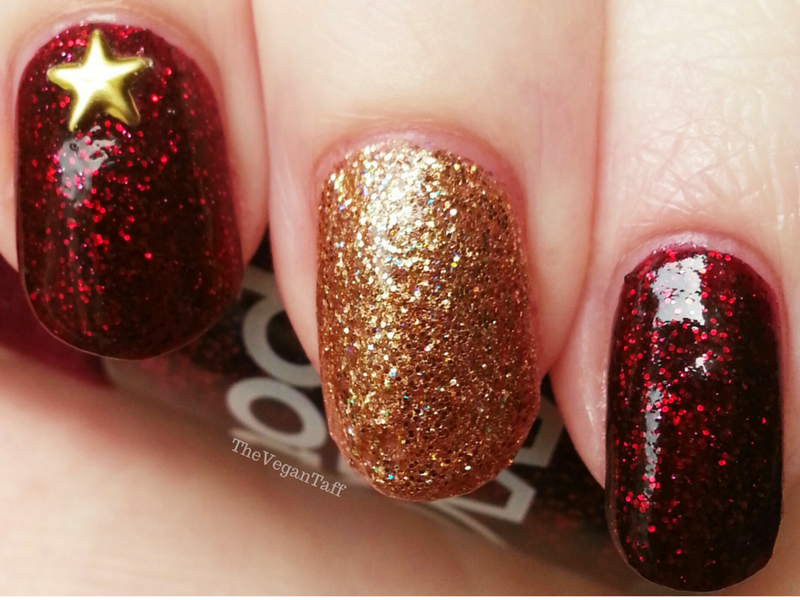 What are you wearing on your nails for Christmas?